What do you do after you have all consumed your body weight in Easter chocolate? Of course, you get out of the house for a couple of hours and head to the circus. Paulos Circus has been in Coleshill for a couple of weeks and we grabbed one of their last shows before they move up to York. We headed over to Melbicks (which lucky for us was a mere 10mins away) and upon arrival couldn't help but spot the Big Top; from that second the Small kept asking us when the show would be starting. Once we had collected our tickets, found some seats and settled in we were ready for the off. In between each act, we had Mr.N to entertain us, and with some traditional comedy and a little audience participation, it kept everyone engaged for the duration. I really enjoyed the intimate size of the Big Top, it created a fab atmosphere as every seat was full of ages young and old. 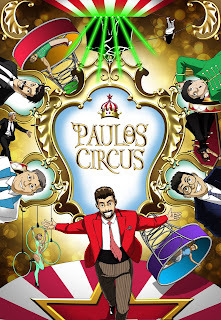 Paulos is only in our nect of the woods until tomorrow (April 2nd) and then they move onwards to York (check their Facebook for all the dates). With all tickets £7, it is most certainly value for money all around.